We have release our new volunteer management module. Using this you can track your volunteer efforts to add value to a case. track the service log for both time and mileage. 1. Activity Log - RMS now keeps track of every click in the system so you can see who did what. Currently the activity is tracked for the past 30 days. 2. Enrollment - Allows you to select any program and a date range to see what enrollments were processed. 3. Job Placement Report - Find who getting a job for the date range selected. Just more reasons we are the leading Refugee Case Management system. Referral comments - When referring a client the users performing the referral can now add a comment. The program manager processing the referral can use this information during the enrollment process. Add/Delete Documents - Documents can be added and deleted from an enrollment. For example during program enrollment all language versions of documents are populated to a case. A case worker can now removed unneeded documents that have languages that do not pertain to the case. Caseworkers can also add a document if they need and extra copy of a document for whatever reason. This puts your agency another step closer to full electronic case management. Language levels - There is now an unknown option for language comprehension level. Case Contact - There is now select a county when creating contact information for a case. While working on adding county we went ahead and added the contact screen as part of the case creation wizard. Assurance Date - There is now an optional assurance date that can be populated as part of the case data. Release First Payment when creating a recurring expense - when creating a recurring expense the first payment was already released into the approval process, we've added a checkbox in the event that the requestor doesn't want to released that first expense just yet. Dashboard - We've also release an Alpha version of our new dashboard. How are the leading US resettlement affiliates in the United States managing to keep track of resettlement? 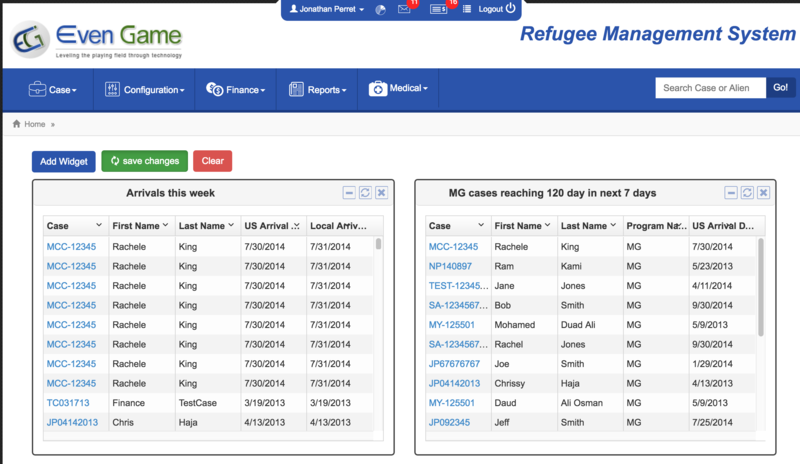 They are using our industry leading refugee case management software. The refugee resettlement controversy in Montana has resulted in some supporters of resettlement receiving death threats. Now those supporters are rallying together. The International Rescue Committee came to Missoula in November 2015 to determine the city's ability to accept refugees. The IRC has said that Missoula could sustain around 100 refugees a year. They have submitted an application to the state department to bring a resettlement agency to Missoula. Refugee Management System (RMS) Software made significant improvements to our documentation process and minimized Case Managers’ time on completing required paperwork. The new software allows staff to manage client needs and field work more effectively and in a timely manner. Whether you are single, dual or tri agency affiliate RMS can meet your program needs. The software allows you to keep track of flex fund expenses easily and accurately with the ability to know how much flex funds are available at any given time to spend on most vulnerable refugees. Jonathan and Steve are very easy to work with and have a thorough understanding of the Refugee Resettlement Program. I strongly recommend this software to all resettlement agencies." The Alliance’s customized Refugee Management System (RMS) Software is the result of ongoing collaboration among our directors, resettlement staff, and the software developers. Jonathan and Steve are very knowledgeable about refugee resettlement and this new software will help guarantee accurate, accessible data for documenting services and monitoring expenses. Managers can track and follow up on core services delivery in near real-time. Through RMS, the Alliance’s diverse range of refugee support programs (ESL, Drivers Education, Employment, Case Management, Asset Building, Vocational Training, etc.) will now be more fully integrated with our core Resettlement program. The Refugee Solutions team takes a value-added approach that goes beyond basic data collection. We now have a wealth of quality data that can be accessed by program managers and the resource development team to enhance our agency’s strategic planning. Another important feature is the internal notifications, which help programs communicate quickly and seamlessly with each other. Jonathan and Steve have built a user-friendly database that lets us spend more time on delivering quality services to refugees. I am very happy with RMS’s strong performance and look forward to collaborating over the long-term on new features and updates." Refugee Solution is your technology solution to help refugees prosper.